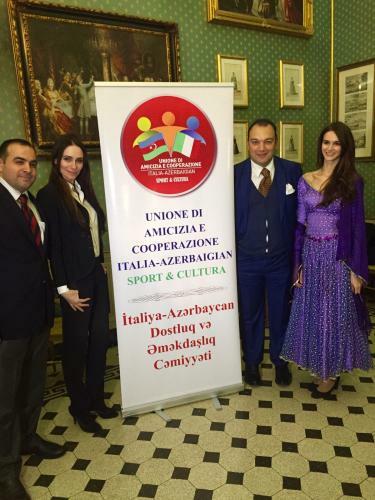 Rome - The official presentation of the association of "Union and cooperation between Italy and Azerbaijan" chaired by veteran journalist Dundar Kesapli and Azerbaijani entrepreneur Rashad Gurbanov was held this week in the 18th century Palazzo Ferrajoli on the Piazza Colonna. The event Monday night in the building facing Palazzo Chigi, the office of Prime Minister Matteo Renzi, started with a demonstration of a promo video, presenting a large range of Azerbaijan benefits such as colourful culture and folklore and beautiful wildlife but also the extensive oilfields being a wonderful opportunity for investors, innovative companies and shots of the lively capital Baku. In Kesapli's speech, the Italy - Azerbaijan friendship was presented as strategic in economy sectors as well as for companies in the agricultural and food industries and culture. The president of the association recalled also the Azerbaijan contribution in the Milan Expo universal exposition. "It 's time to give answers to those who are opposed to the cooperation of the people and respect difference of cultures," said Kesapli. "More and more Italian companies are working in Azerbaijan, as well as more and more Azerbaijani realities operating in Italy." The association was founded in April and a presentation was made the capital of Azerbaijan, Baku, in May. l'Espresso correspondent Gianni Perrelli.described the association’s role as providing a bridge between Europe and central Asia. As a country on the border between Europe and Asia, Azerbaijan has considerable potential for Italian investors. Since now the cooperation is better than ever, there is also many possible projections of economic exchange between countries. 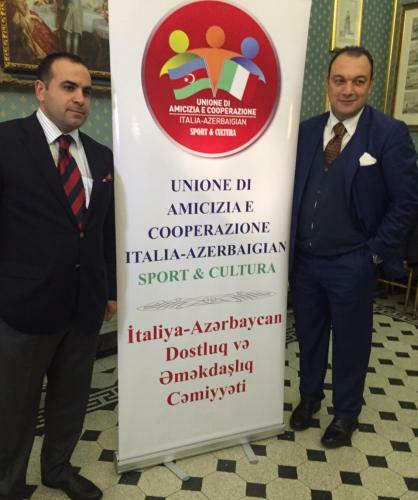 Adviser to the Azerbaijani Embassy in Rome Vugar Hajiyev, who was also present at the event, expressed the will that Italy and Azerbaijan will cooperate in many fields. "The newly established organization will enrich also sports and cultural relationships. As an Embassy, we support these kind of initiatives," he added. The aim of the association is to support bilateral relations between the two countries in the fields of culture, economy, politics, fashion, cultural exchanges between students, tourism and sport, and foster dialogue on economic and cultural profitable opportunities. The event was also attended by well-known Roman personalities including Nino Benvenuti, Elisabetta Pellini, Piero Pacchiarotti, Daniela Del Secco, Bruno Liconti, Donatella Scipioni, Linda Batista, Marchesa Laura e Silvia Squizzato, Cattherina Cittadino, Giorgio Ginori, Germano Dottori, Lisa Marzoli, Margherita Basso. The event was organized together with the Marco Polo Experience, a firm which specializes in the development and implementation of communication campaigns and promotion of Made in Italy.